Sideshow Toy's next Premium Format Figure: the White Queen! 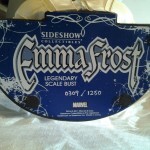 14 photos of unboxing Sideshow Collectibles' Emma Frost Legendary Scale Bust. We Love Fine has created 2 new t-shirts for Emma Frost!